Defence lawyers for five men accused of plotting the 11 September 2001 attacks have challenged the fairness of the military tribunal at Guantanamo Bay. 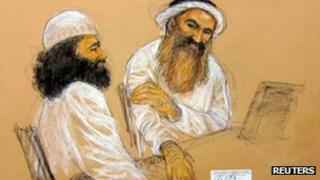 The defendants, who include the alleged mastermind of 9/11, Khalid Sheikh Mohammed, were formally charged with murder and other offences on Saturday. None of the defendants has yet entered a formal plea, and during the hearing they mostly remained silent. The men's lawyers say the court is censoring evidence of torture. The defence counsel at Guantanamo are a mix of military and civilian lawyers. At a joint news conference they complained of what they called "assembly line justice" protected by a "veil of secrecy". Khalid Sheikh Mohammed was repeatedly water-boarded in secret CIA prisons before being brought to Guantanamo. His lawyer, David Nevin, said "everything is being done to prevent this [tribunal] from being fair". Our correspondent Steve Kingstone, who is attending the tribunal, says that under court rules the lawyers are forbidden from discussing torture with their clients. Mr Nevin characterised that as a form of "thought police". The lawyer for another defendant, Waleed Bin Attash, said her client had begun removing his shirt in court to show ""a few scars on his arms". "We are hoping to address that with the court to help him get a fair hearing on that," Cheryl Bormann told reporters. She added: "I have reason to believe he's been subjected to mistreatment while in the camps." In response, a Pentagon spokesman expressed scepticism about such claims. "We take allegations of detainee abuse very seriously and all such allegations are fully investigated," said Lt Col Todd Breasseale, a spokesman for the US Department of Defence. "Intimation that this group of service members - each of whom are very highly trained and under strict, continuous scrutiny - abused or otherwise purposely mishandled the detainees in their charge simply does not withstand intellectual rigour." Waleed Bin Attash's lawyer also raised the issued of the rules under which the hearing are being held. "Of course, the fact that the hearings themselves aren't transparent and aren't fair, means that we'll probably be constrained on what we can say on that as well," said Cheryl Bormann. James Connell, who is representing Ali Abdul Aziz Ali, said: "These men have endured years of inhumane treatment and torture. This treatment has had serious long-term effects and will ultimately infect every aspect of this military commission tribunal." The tribunal will reconvene next month, but several defence lawyers expressed doubts as whether the case would ever come to full trial.